I got to see some of Friday night game--the moment Moises Alou broke up Tim Hudson's no hitter. That made me slightly mad. Then Cablevision decided to reset my cable box over the weekend, meaning that I got neither Ch. 11 game on tape. And now Keith isn't working the Rockies series...which I'm okay with. I'm only getting to see about an hour of it total, so at least I won't miss any Keith goodness. And I just got to see a great Carlos Beltran catch! Lastly, I will be going to D.C. Friday to see two out of the three games of the Nationals series, so the blog will be kind of quiet until next Monday. UPDATE: Zoe at over at Pick Me Up Some Mets has some nice Keith visual aids to share. She's also on top of Keith's Tootsie Pop fixation. Gary: "You think somebody somewhere said something?" Gary: "But, you know, you're Keith Hernandez." Keith: "He doesn't like that call." Gary: "Here's Aaron Boone. He replaced Miguel Cabrera. He was removed earlier with what's being called [Gary chuckles] a 'tight right torso.'" Gary: "I've never heard that term before." Keith: "He looks like Beetle Bailey. (pause) I'm not being contemporary with this am I? Well, what I remember in the paper was Blondie on top of the paper and on the bottom was Beetle Bailey." Keith: "I'm six feet tall--and these days everyone's taller than me. I don't like that." --Pressure? What pressure? Tangent? What tangent? Keith: "There's no pressure in this job; I don't have to be on the field. If I get ripped in the paper in a review for what I say, it's not like I went 0 for 4 and left 15 men on base." Gary: "I've been reading the reviews." Keith: "What reviews? We're under the radar here." Gary: "Well, they're all good." Gary: "See, that's how you can chew on that lollipop and why you're so footloose and fancy free..."
Keith: "To get back to the game...we kind of went on a tangent there..."
Weekend Preview: For the first time since Mike and I finally wrestled Zisk online two plus years ago, we're both unable to blog about the Mets. Mike is wrapping up his spring tour and won't be home till Sunday. I'm out marking my best friend's birthday Friday and Saturday and Sunday I'll be upstate visiting my family. It looks like Friday night's game will fall through the cracks, but I plan on taping Saturday and Sunday's games and boiling down the highlights into a neat package Sunday night. First place feels good, doesn't it? Gary: Did that keep you interested the whole time? Keith: No, I feel asleep. Ron Darling: Hey, those 4 p.m. starts are prime nap time. Right after that comment, I fell asleep. I woke up at 9 a.m. (with only 4 hours of sleep under my belt) with a painful muscle spasm in my calf, so getting some nap time seemed more important than the rubber game of the series. (And I missed the second loss to Braves this year, so I felt better about my nap when I woke up at 4 p.m.) I did write down one more great comment from Keith about the shift the Braves employed while Carlos Delgado was up. Keith: That hole there, you could drive a whole panzer division through there. Gary: Um, how many tanks is that? I won't be able to listen to today's game because of the daytime start, but at least Keith's visuals kept me entertained. 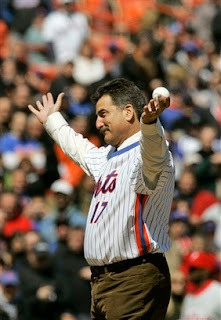 When throwing out the first pitch to Howard Johnson, Keith had his number-17 jersey tucked into his suit pants. Who does that? In the top of the third Gary Cohen mentioned that he knew a new season was upon us because "Keith is about to chomp into his first Tootsie Pop of the year." Keith went on to say he started on it in between innings, but now that they were back on the air, he was all business. "When I'm broadcasting, I have to be professional. I can't have chunks in my mouth." When asked by Ron Darling how long one Tootsie Pop would last, Keith said four to five innings. Gary wrapped up the culinary conversation of the evening by saying, "they're not supposed to last that long." In the top of the 4th Carlos Beltran got tagged out by Scott Rolen on a ground ball hit to third. It was unavoidable and at least Beltran made sure there was no attempt at a double play. As the replay rolled Keith commented, "A rare base running error--oh, wait, it's first and second. I'm out of my mind." As Gary talked about rookie reliever (and former Brooklyn Cyclone) Joe Smith being nervous in his first major league appearance Sunday night, he asked Keith, "How do you stay calm [on the mound]?" Not missing a chance to make people in the five boroughs crink their necks and think, "Did he just say that," Keith replied, "If you're scared, get a dog." And in the bottom of the 7th, Keith described a Cards home run by stating, "Rolen was on it like a rash." While describing one player's swing, Keith said the guy was "bunching up." After some laughter from Gary and Ron, Keith mentioned how the SNY producers keep saying to not use the same words over and over. "So bunching, it's one of my new words." Gary: "That was the Keith Hernandez Confused Moment of the Night." Keith: "I was going to ignore that completely. I was doing my Sergeant Schultz impression." Ron: "If we had a new sponsor for that, we'd have one every night." With all of that Keith goodness and another seemingly non-stressful win, it feels like 2006 all over again.